Images © DC Comics, Inc., except as noted. I’ve written about balloon placement in my book, The DC Comics Guide to Coloring and Lettering Comics and also on my website. When I started in comics, lettering was laid out on the art by the penciller, at least at DC Comics. Artists like Curt Swan would pencil in all the dialogue so he and the letterer would both know where everything should go, and that it would fit. The Marvel style of comics creation spearheaded by Stan Lee started to change that. Marvel artists like Jack Kirby and Steve Ditko would lay out an entire story from a plot, and Stan would write the dialogue afterward. 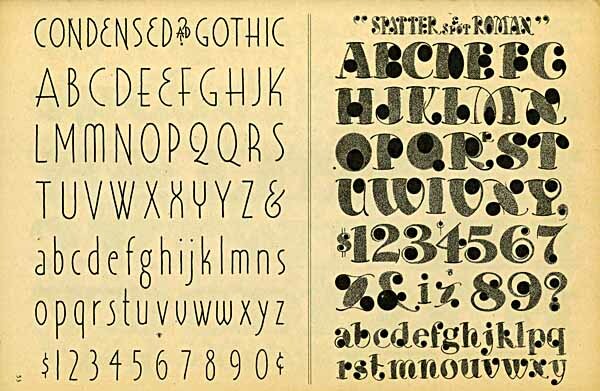 This was fine with experienced artists, but later ones using the plot-first system didn’t always have a good handle on how much space to leave for lettering, and the situation has only gotten worse since then. 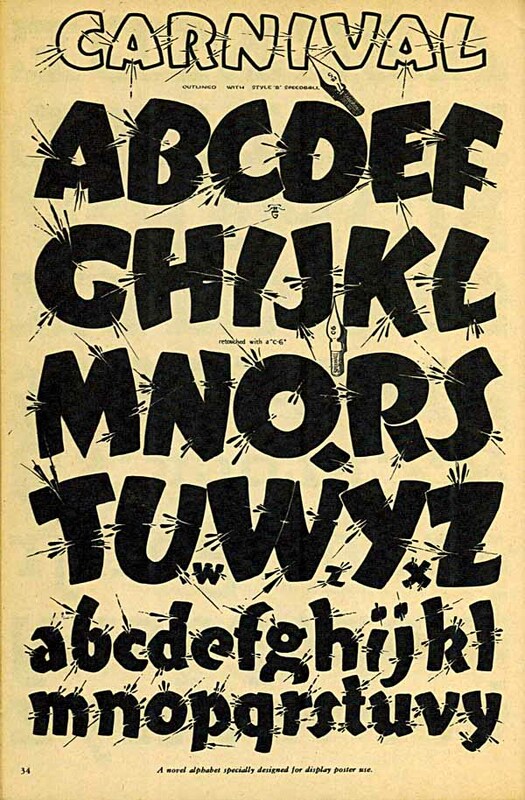 Today many letterers are expected to do their own lettering placements, and often have a tough time of it. Newer comics writers and artists who don’t really understand the medium and how it tells stories both contribute to the problem. The writer will try to do too much in one panel: multiple actions, back and forth dialogue. Artists struggle with that, and also make basic storytelling mistakes like having the first character speaking on the right side of the panel instead of the left, or filling the panel with large close views of character heads, leaving no room for dialogue balloons. This entry was posted in How To, Lettering/Fonts on August 2, 2014 by Todd. Images © Ross F. George estate and/or Hunt Manufacturing Co. 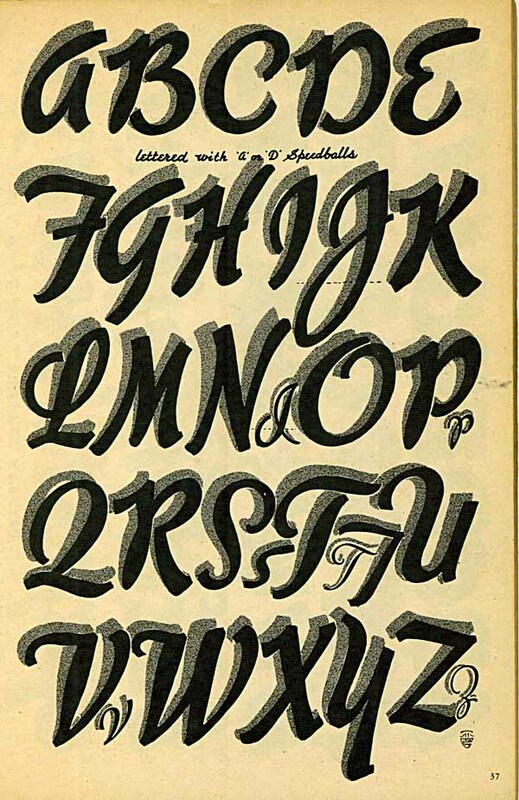 Continuing my commentary on this 1941 lettering and design handbook. Previous chapters can be found under the “Lettering/Fonts” category tag on the right side of this blog page. This entry was posted in How To, Lettering/Fonts on March 29, 2014 by Todd. Images © estate of Ross F. George/Hunt Manufacturing. 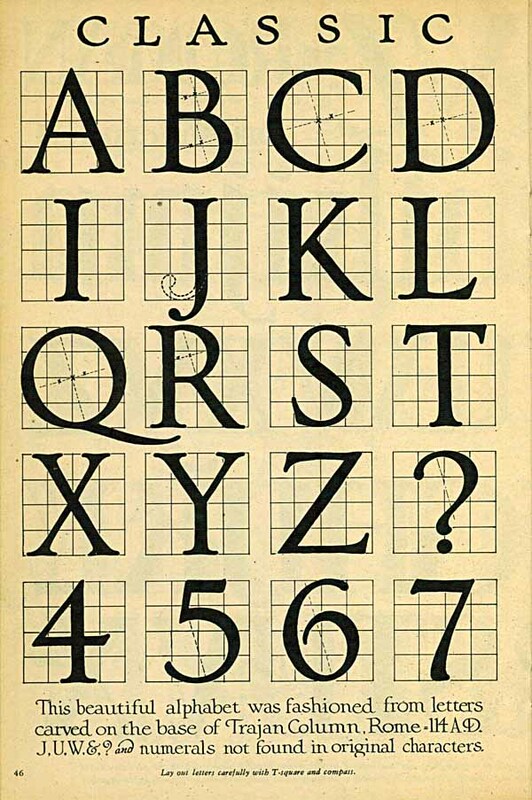 Continuing my look at the 1941 edition of this lettering how-to booklet, on these pages George takes us back to the beginnings of the Roman alphabet as we know it. 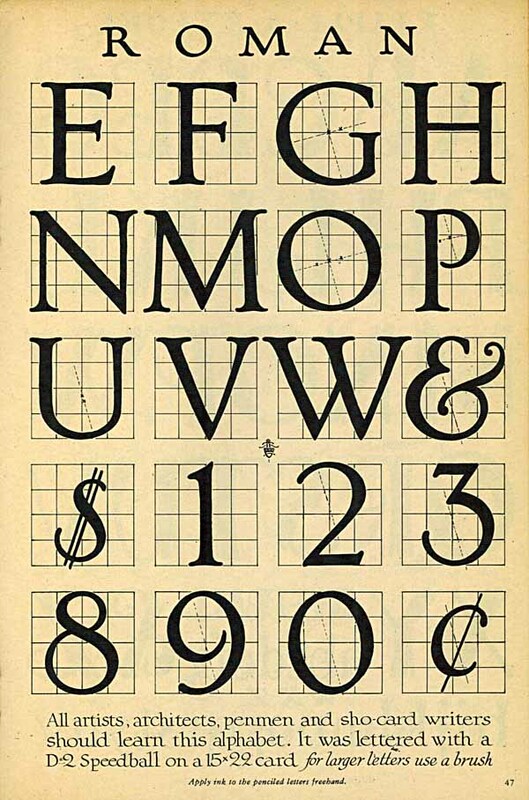 By placing each letter on a five-by-five line grid, and also showing the angle he used to work out the thick and thin variations of the strokes on some of the circular sections, he’s made it easy for anyone to reproduce these letters much larger. Simply prepare a much larger grid and sketch out the black areas in each section. It’s a time-honored way of transferring small things to large surfaces reasonably accurately, before computers. Note that, while based on the Trajan Column letters, his forms have softer and more rounded serifs and corners. 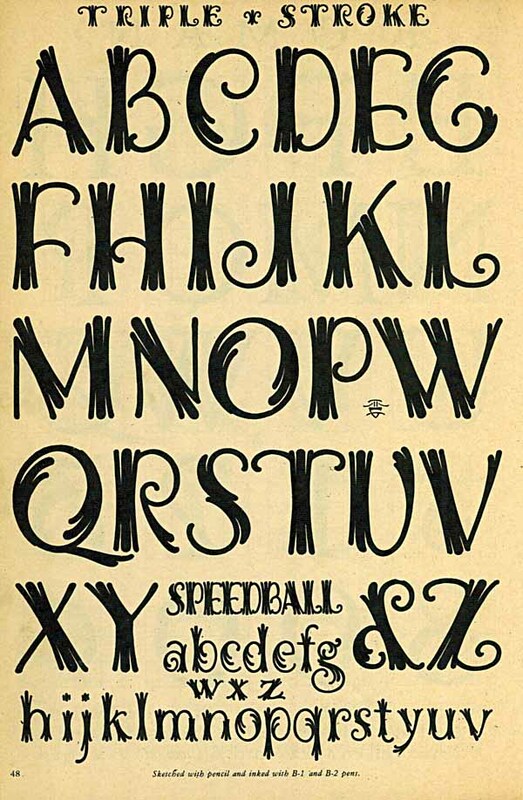 The name Triple Stroke says it all in this classy use of round-tipped pen points to create decorative letters with a New Orleans flair to my eye. At the smaller size it’s still easily readable, too. Here’s a very elaborately decorated open letter style with a Circus feel. It might also look nice on a party invitation. Rather hard to read, so something you would use sparingly. George calls this Stunt Roman signifying that he considers it a lettering equivalent of showing off or performing for the crowd. 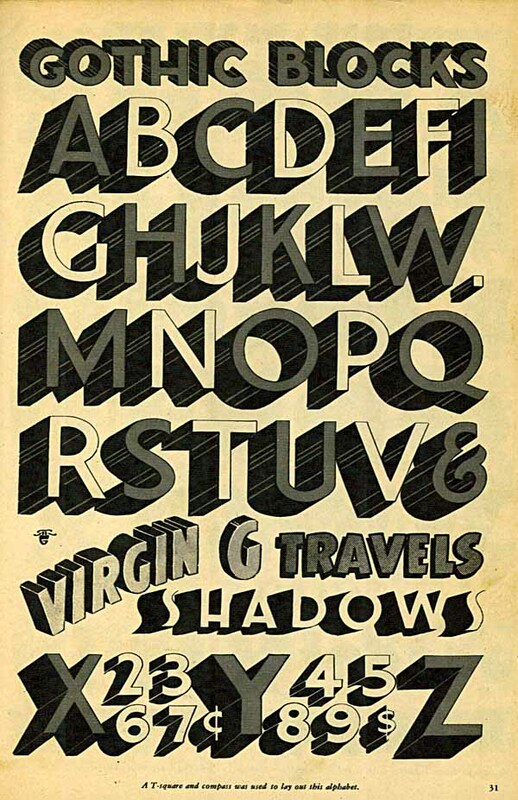 The letter forms are very stylish, Art Deco in the extreme. I like it, though again would use it sparingly. 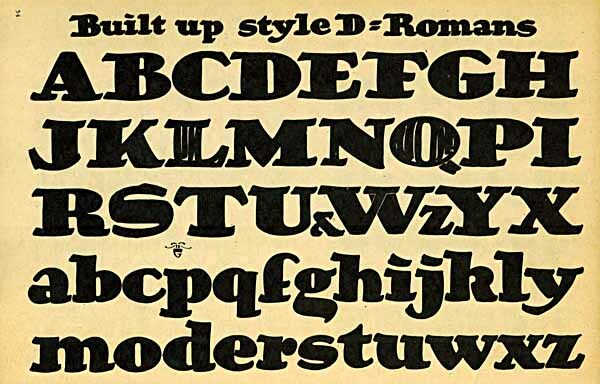 There’s a font called University which is clearly based on this. 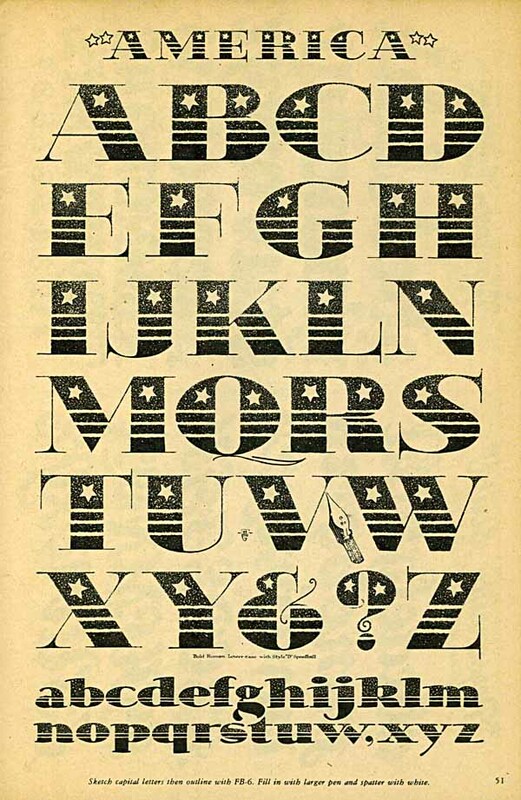 A patriotic style that works well for these large letters, the thin strokes would disappear at smaller sizes. 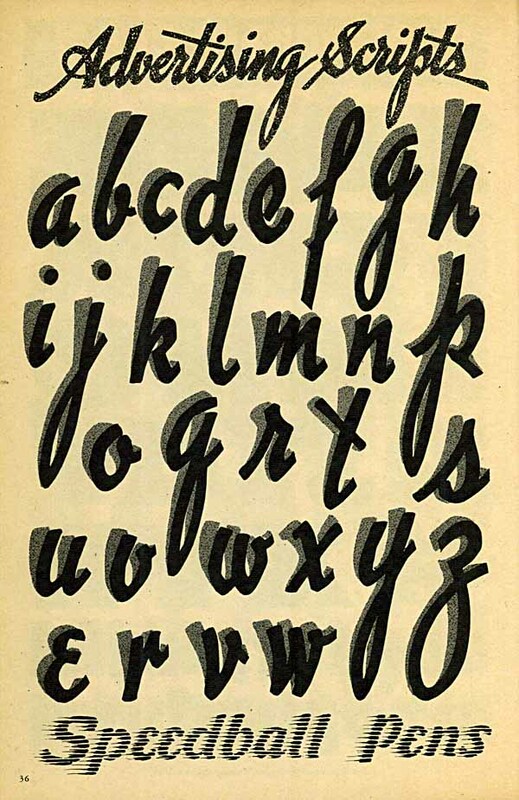 These alphabets use the idea of wobble, adding a rough or crude look by making all the strokes uneven in random ways. It’s an idea I used often when lettering comics, though not in these specific styles. 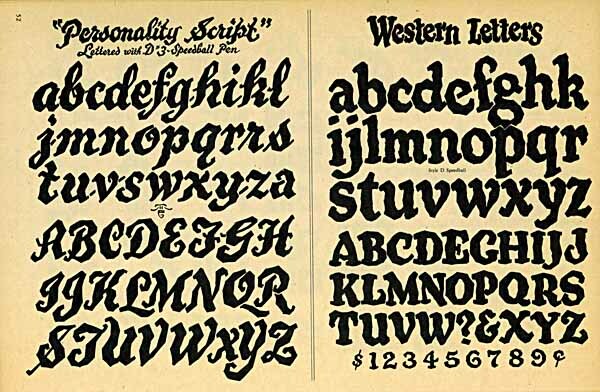 “Western Letters” suggests the crudeness of signs in the Old West, I guess, though I’ve never seen anything like it in real Old West imagery. The final page in this post is full of contrasts. 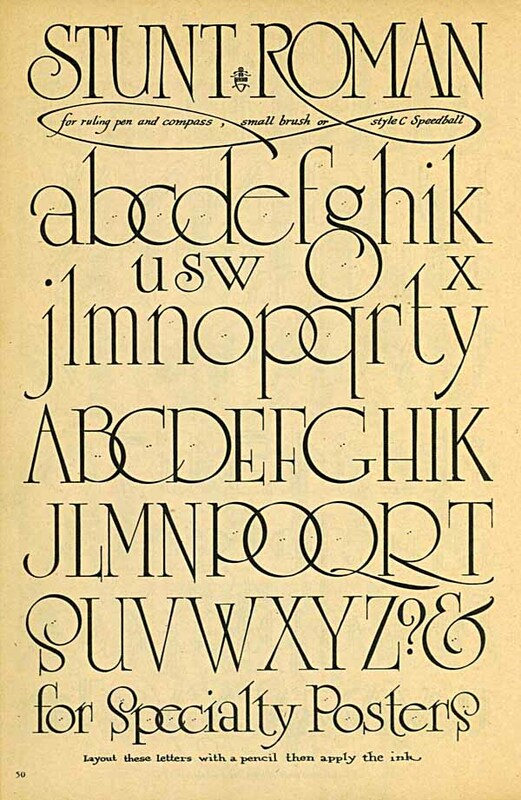 On the left is a stylish condensed Art Deco alphabet that I like, though the strokes are a bit thin. On the right is an experiment in tone and rounded shapes that I find almost unreadable and rather ugly. Well, they can’t all be winners! More next time. This entry was posted in How To, Lettering/Fonts on March 1, 2014 by Todd. Images © estate of Ross F. George/Hunt Manufacturing Co. 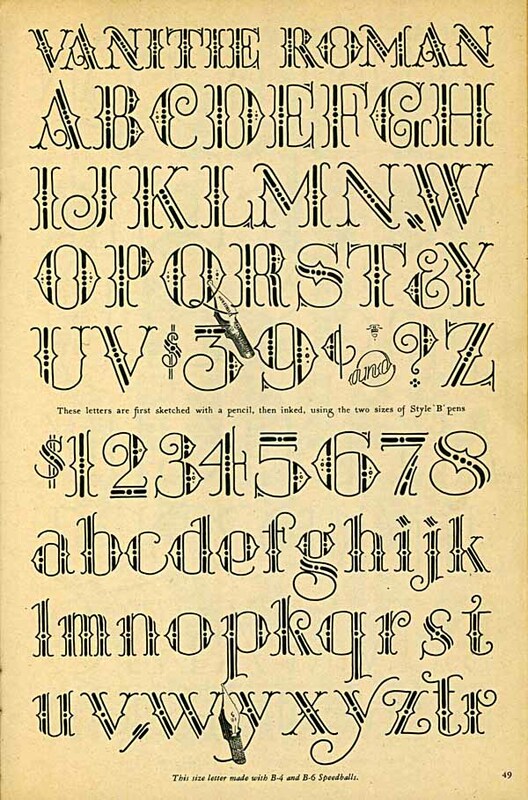 This entry was posted in How To, Lettering/Fonts on February 7, 2014 by Todd. Images © Ross F. George/Hunt Manufacturing Co. Previous parts of this series can be found in the “Lettering/Fonts” category on the right sidebar of this blog. As I’ve said previously, author/artist Ross F. George is wildly inconsistent with his style names, and this one is a doozy. 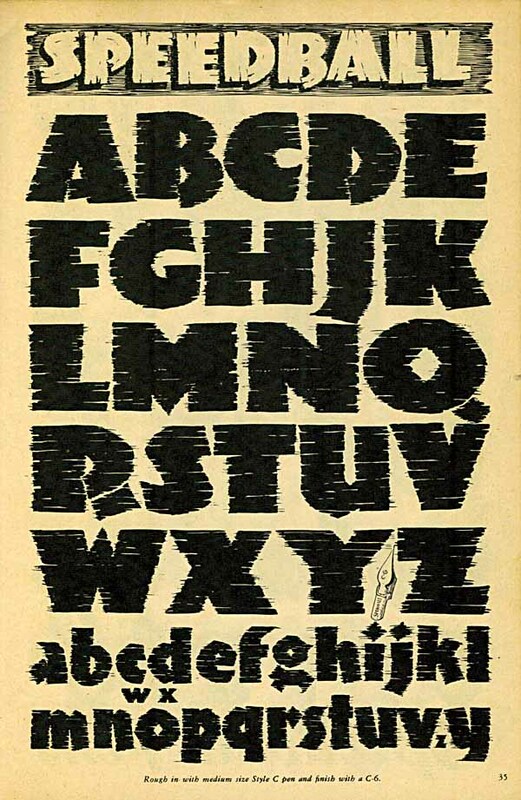 It imitates the carved-in-stone letters on Trajan’s Column in Rome from about 100 AD, and is as classically Roman as you can get, but George calls it “Gothic with a touch of Roman.” Name aside, it’s a fine example of the style and how to shade it for pen and ink, although by putting the blacks toward the bottom (as he has on the bottom half) it seems to make the letters seem raised rather than cut in. Perhaps that’s the idea. I also love the playful glow centered on his artist symbol. By Gothic, George means sans-serif. 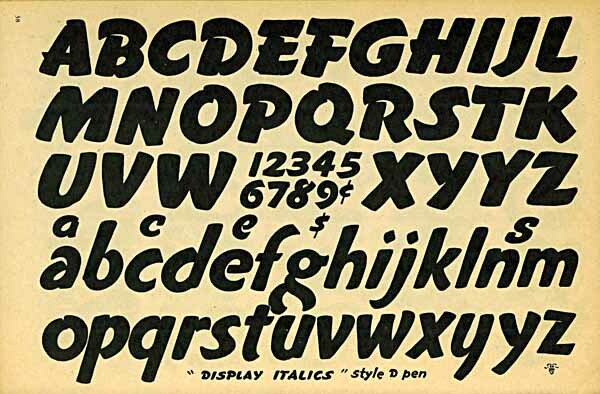 These are open block letters with drop shadows that have the same kind of shading and edge lines often seen in comics at least since Joe Shuster’s original SUPERMAN logos on the first few issues of that title, and of course Ira Schnapp’s version, which is very similar to the word VIRGIN above. It was a common style at the time, I believe, but it would be interesting to know if Schnapp and George looked at each other’s work. There’s a lot going on in this style: art deco, stylized white bricks, white circles, white spatter shading. It’s still pretty easy to read despite all those distractions, even the smallest letters. One of George’s best creations, but not something he could have used often, I think. 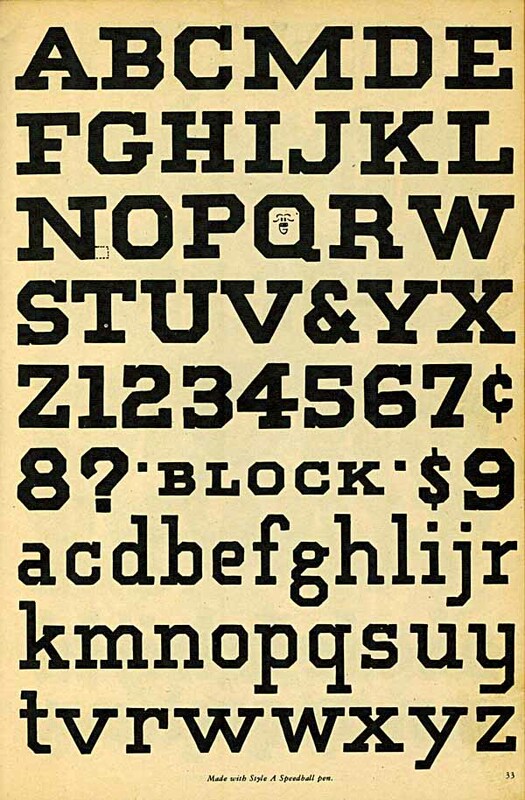 An example of slab serif block letters, the kind often used on team shirts. Not very gracefully done in some areas to my eyes. Now this one is pure fun and full of life and movement, a delight. It reminds me of of comic strips and cartoons where things are likely to explode at any moment. I like the way the exploding bits are both black and white, extending them into the letters. Another one I love, it’s all about texture and horizontal movement akin to speed lines, but part of the letters. A great example of how texture can add interest to the simplest forms. Love the extra thick letters, too. I don’t care much for this style, though I do like the style of the titles at top and bottom. The latter IS an example of speed lines. 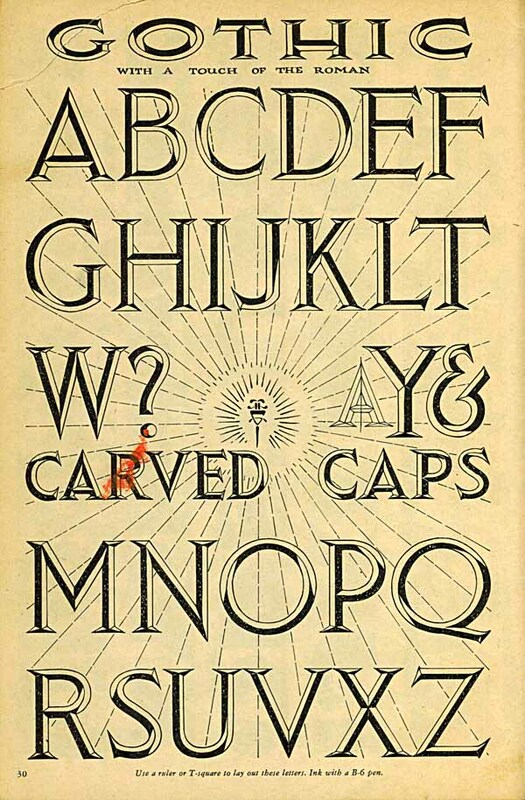 The main alphabet lacks grace, and the shadows don’t help any. Here’s the rest of the alphabet and some variations. Still don’t like it. They can’t all be winners, I guess. 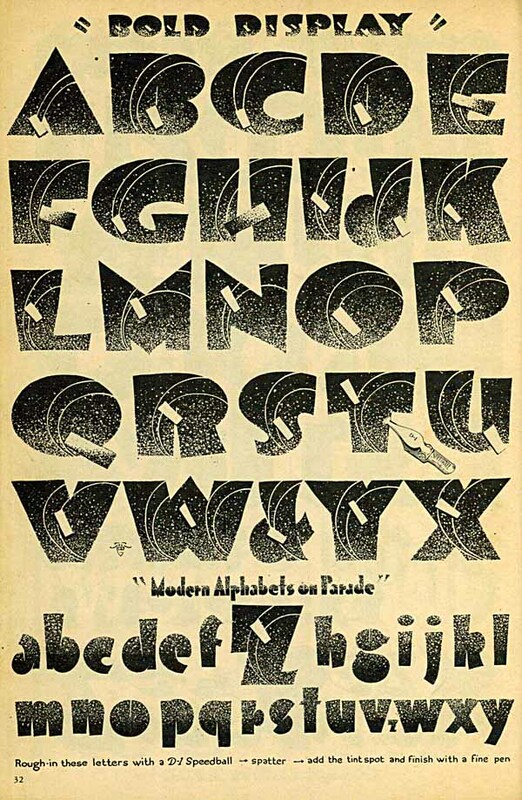 This entry was posted in How To, Lettering/Fonts on January 7, 2014 by Todd.